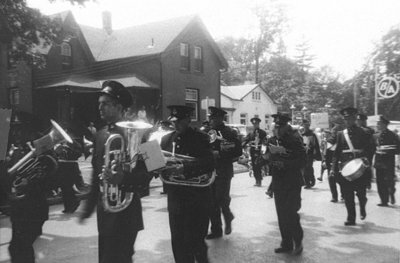 Black and white negative showing the Whitby Brass Band marching on Dundas Street between King and Centre Streets. Whitby celebrated its Centennial of Incorporation as a town from 26 June to 3 July 1955. Whitby Centennial Parade, July 1, 1955, Harold Collins, Whitby Archives, 30-012-108.